A Baylor Scott & White logistics employee retrieves supplies that will be shipped to facilities throughout the health system. When Baylor Scott & White realized that it was paying more than its peers for certain equipment and supplies, the numbers just didn't add up. The Dallas-based system relied on data benchmarking tools to see how much it paid for products used in various service lines, such as artificial hips and knees. The organization found that it sometimes paid more than average, and as a large system—the largest not-for-profit in Texas—that should not be the case, said Tony Johnson, senior vice president and chief supply chain officer. Tired of paying intermediaries' price markups, some providers are getting better deals elsewhere. "The way I would describe us two years ago is a loose confederation of states when it comes to the supply chain—every hospital basically made its own decisions," Johnson said, adding that the same supplier was charging different prices at different hospitals. "If you are a large health system, why not bring everyone to the table?" Guided by the benchmarking data, Baylor Scott & White started systematically picking off different service lines and negotiating directly with manufacturers to standardize its purchases, which allowed it to save money and ensure continuity across its system. In March, the 48-hospital system bundled total joints and cardiovascular devices and supplies, saving $32 million. In August it launched a new wave of categories that has saved it $20 million. "It takes time but I don't think anyone can argue with $32 million," Johnson said. "On top of that, it is helping to evolve our health system's thinking and 'systemness.'" Supply chain costs are often providers' second-highest expenses behind labor. Hospitals and health systems have a renewed focus on squeezing every dollar out of the care continuum as new payment models emerge, reimbursement from payers shrinks and expenses rise. Bundling purchases and standardizing equipment are not new concepts in healthcare. But providers that strike out on their own to do so represent a growing dissatisfaction with the status quo. Traditionally, group purchasing involved creating networks to bundle purchases in seeking the best price. Some providers, fed up with what they say are inflated GPO prices, have sought bargains elsewhere. "GPOs are really dinosaurs in the industry," said Rob Austin, associate director at consultancy Navigant. "They are working to change, but the whole model is based on aggregated volume—they must change to survive." GPOs are working to adapt as they stand to lose purchasing volume amid increasing competition and shifting preferences. Some large health systems have created or acquired their own GPOs for their regional markets-including Intermountain Healthcare (Intalere), UPMC (Pensiamo) and Mercy (ROi)-and have signed up other hospitals and post-acute providers. Smaller, regional GPOs often carve out a niche, such as physician preference items or purchased services, to supplement a provider's national GPO. Meanwhile, national GPOs are creating consultancies related to boosting patient-satisfaction scores, eliminating variation, standardizing utilization and lowering readmissions to capitalize on value-based reimbursement models. They have also formed private drug labels, where they contract directly with a manufacturing company to make a generic drug under their own brand name, and have acquired GPOs that serve providers outside the acute space. "It's more than just cost—it's about how the supply chain can help reduce readmissions, change utilization patterns like helping reduce the number of needle sticks to save money and improve quality," said Christopher O'Connor, president of Acurity, a regional GPO with 300 member hospitals that was founded as GNYHA Services by the Greater New York Hospital Association. "GPOs are looking at the supply chain through that lens—they are almost unrecognizable from what they once were." While national GPO Premier saw slower revenue growth in group purchasing for its fiscal 2018 first quarter, the company's advising services provided a boost. Premier—which acquired the specialty pharmacy business Acro Pharmaceutical Services as well as the non-acute GPOs Innovatix and Essensa last year—saw its performance services segment increase by 7% to $84.8 million in the first quarter, up from $79.5 million the year-ago quarter, driven by its cost-management consulting business as well as growth in software as a service-based informatics subscriptions, applied science services and government services revenue. Premier said that health systems are relying more on its GPO as provider-supplier contracting costs are high and savings incremental. But providers worry that an expanding business model can translate to higher costs for purchasing. 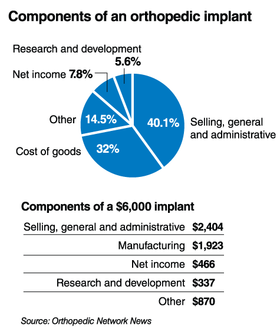 About 40% of the price of an orthopedic implant is tied to sales, general and administrative expenses, while the actual cost to manufacture the device represents only 32% of the total price, according to data from Orthopedic Network News. Maury Regional Health uses its GPO, Vizient, more for strategic consulting services than purchasing. The independent Columbia, Tenn.-based provider saved about 30% off the GPO price when it purchased six CT scanners through OpenMarkets, a software-driven marketplace for healthcare equipment used by hundreds of hospitals and suppliers, said Roger Larkin, Maury Regional's director of supply chain. "Capital equipment prices have such a markup and margin" for GPOs, he said. "When we bought six CTs, we bid it out and brought in the vendor and all of our key people so we didn't have people splintering out. We used the GPO to facilitate this but did not use their pricing." Maury Regional also saw significant savings when it trained engineers to repair its equipment in-house, Larkin said. Baylor Scott & White is also opening a repair center so it can maintain its equipment internally. Baylor Scott & White plans to circumvent traditional middlemen by launching an e-commerce site this month for its internal supply chain network that looks to replicate Amazon's ease of use, prompt delivery and transparency. The site will complement its relatively new distribution facility. Amazon announced a partnership last week with Berkshire Hathaway and JPMorgan Chase & Co. to form an independent healthcare company for their employees. The e-commerce giant continues to snap up healthcare experts to round out its executive team and has quietly expanded its medical supply offerings on its Amazon Business platform as demand from hospitals and health systems grows. "We have had discussions (with Amazon) and tried to influence how they approach healthcare and gave them things to consider as they build their platform out. I do think they will be a disruptor," Baylor Scott & White's Johnson said. "Some traditional businesses are rethinking their model." Indiana University Health recently launched an effort to standardize purchasing of commodity supplies at its 15 hospitals and ambulatory facilities, with the help of its GPO, Vizient. 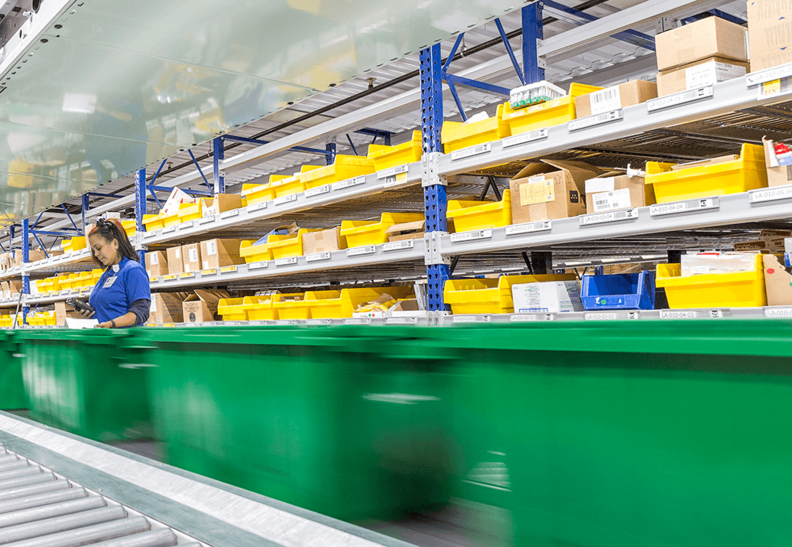 The standardization should bring supply chain savings as IU Health moves into a distribution center in Plainfield, Ind., said Dennis Mullins, senior vice president of supply chain operations. "We hope that culturally, as an organization, people stop using things that aren't standardized," he said. "There is a lot of low-hanging fruit now that will not be there in a year or two, but we won't stop." While the common, simple items are easier to bundle, providers are challenged by physician-preference products and more sophisticated items. Some hospitals and health systems including Baylor Scott & White have hired executives with experience improving supply chains outside of healthcare to help. GPOs are embracing the role of getting physicians, clinical staff and administrators to agree on supplies to ease these more complicated purchases, said Rick Conlin, a partner and supply chain specialist at the Advisory Board Co.
"Physician-preference items rely heavily on consulting engagements and the manpower required for more personalized service instead of offering catalog-like services," he said. "GPOs are offering these localized consultant-esque agreements frankly because they are following the money." Salt Lake City-based Intermountain's GPO, Intalere, manages internal as well as other providers' supply-chain needs. It also has a distribution center, which has bolstered its supplier relationships and helped eliminate redundant inventory, the company said. GPOs need to use data and be transparent in addition to lowering prices to remain relevant, said John Wright, Intermountain's vice president of supply chain. Managing purchasing internally has helped lower costs, he said. Suppliers have fewer customers as systems consolidate, so they need to get more creative with shared-risk models to cut waste from the supply chain. But they've been slow to do so, Navigant's Austin said. While there has been progress in tying food and janitorial service contracts to patient-satisfaction scores, risk-sharing arrangements in the clinical space with outcome- and readmission-related metrics are in the very early stages, he said. Medical-device manufacturer and health technology company Philips recently extended a contract with Phoenix-based Banner Health, one of its roughly 40 strategic provider partners. Philips says its technology helps monitor patients with multiple chronic conditions at home, cutting hospitalizations in half and reducing 30-day readmission rates by 75%. It collects vital signs and other data with virtual monitoring and connects Banner physicians and patients via a video feed. There is an emerging group of customers that want to have risk-sharing contracts and closer vendor relationships to help bend the cost curve and improve outcomes, especially as more organizations form integrated delivery networks, said Joe Robinson, Philips' senior vice president of health systems solutions. Medical-device manufacturer Lisa Laser USA decided to contract directly with manufacturers after its relationship with a GPO yielded minimal results. While GPOs provide a good storefront to browse products, they don't adequately convey the uniqueness of the company's relatively newer products that fall outside the "mainstream," said Peter Allen, CEO of Lisa Laser. There is also a lot of red tape in dealing with a GPO, he said. "From what we've heard, surgeons know what they want but hospitals have such a tight relationship with GPOs that they're almost forced down a different path." The supply chain is one of many elements in healthcare delivery that is poised for an overdue transformation. Providers are looking to upend how decisions are made by shaking up executive ranks, streamlining clinical operations and shifting care settings, among other goals. Theoretically, providers can eliminate some of the fixed costs along the supply chain and trim fat elsewhere, which will benefit their bottom lines. But employer-sponsored healthcare spending per person in 2016 grew 4.6% to $5,407 over 2015. Spending rose 4.1% in 2015. It has jumped by 15% from 2012 to 2016, not accounting for inflation, according to a report from the Health Care Cost Institute. But these savings at the provider level won't necessarily benefit the consumer, Navigant's Austin said. "It's tough to tie it in a meaningful, direct way to lower costs for the patient."